Learn to use an IRC client to chat this famous protocol ! Internet Relay Chat (IRC) let you chat in real time with unlimited number of people, of all age and all country over the internet ! ResEl hosts an IRC server that belongs to RezoSup, a network that gather several ingeneering school and business school. The most used IRC client is mIRC but there are a lot of open source and powerful client, such as HexChat. Why bother using IRC instead of using any other instant messaging tools ? Discussions are made on channels, generally open. On a channel, passionnates people - that doesn't know each other necessarily - can meet and chat, more easily than other messaging tool. It's also possible to talk in private with someone. You can create your own thread of discussion. Your nickname est always unique. You can register it with a password so that no one else can take i to you. 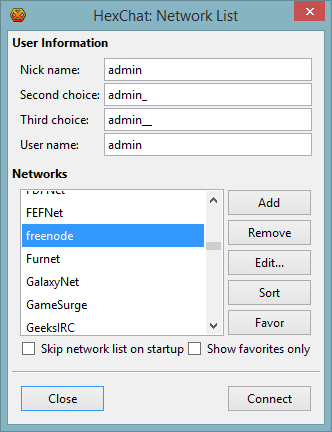 You can be simultaneously on several channels, follow several threads, even be a several servers, with only one window. HexChat is a popular fork of XChat. 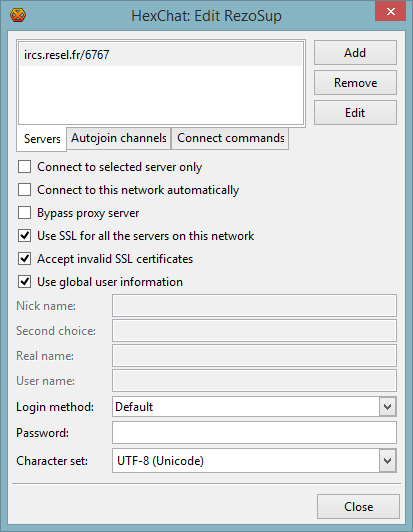 XChat is not free anymore since 2004 ; on Windows you can use it only for thirty days. Download HexChat on the official website. Double-click on the .exe installator. Configure it with the wizard (cf. configuration). HexChat is available on the official mirror of Ubuntu. Simply type apt-get install hexchat or aptitude install hexchat in a root terminal to install it. In jessie and sid, the package is available in the official mirror. Simply type apt-get install hexchat or aptitude install hexchat in a root terminal to install it. Sources are available on GitHub, see on the official website. It may be available on your distro's package manager. First, select your nickname. You also can add alternatives nickname, in the case your first one is already in use by someone. Then, you username. It should be your real name. Now, add a new server with Add. Call it RezoSup. Click on Use SSL for all the servers on this network and Accept invalid SSL certificates. Click on Use global user information. Click on Connect to this network automatically if you want to connect automatically when starting HexChat. Click on Close, then Connect ! Uncheck Use SSL for all the servers on this network and Accept invalid SSL certificates pour le client doivent être désactivés. NickServ is an important service that let you register your nickname. /msg NickServ IDENTIFY password : to identify yourself as the rightfull legitimous user ! If you don't, you'll be re-nicknamed after a short period. /msg NickServ HELP : to have some help. /query nick : to start a private chat with the user nick. /me message : to send a message to describe yourself.